My broadband was down most of this evening. It didn't take long for BT to fix which was good and rather than watch TV all night I decided to do something with my time. The result is the video above. That white stuff is snow. This year the weather is behaving. It's December and there is snow on the ground. That's about right as far as I'm concerned. That's the way I remember December from when I was young. The only thing that's different today is that I'm on my own in a truck and my boots smell like boiled animal bones. I think I might go and have a snowball fight with myself. 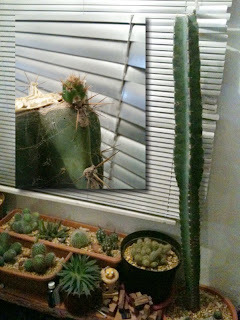 When I first got my tall cacti I set about it with a kitchen knife. It was in a sorry state and I had to cut lots of dead bits off. I then had to re-pot the poor thing and since that time nothing has happened. That's when I noticed a new growth. I suppose life in my collection is balancing out. 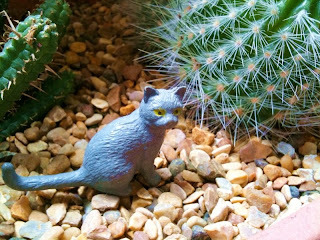 One of my other cacti has decided to give up the ghost. I imagine it's the window positioning. Great for summer, not so great for winter. I am however, optimistic that I will get the balance right one day. Sometimes I find a nice spot to have my lunch. Sometimes I even manage to find someone to share my lunch with. Today I found Englebert the duck. He said that he liked jam donuts and would I like to swap a few bites for a couple of photo's. I said that that was a good swap. Englebert did a few dramatic poses and I fed him donuts. We were both happy. When we'd finished I went back to my truck and Englebert went back to doing The Times crossword. The first thing I did was to add some drums. 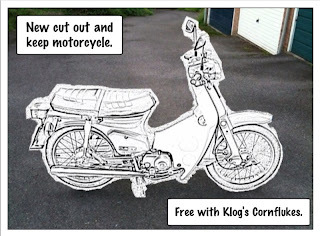 This is done in the Drum Crafter and is really simple. Press Triangle to load a sound and you get a menu to choose from, preview the sounds until you find one you like and hit X to load. It does take a second or two to preview a sound but once it's loaded playback is instant. Other reviews have criticised this delay but no-one said you were getting Cubase and a dual core processor. Adding other drum or percussion sounds is a matter of following the same process and each sound gets it's own track. The drum pattern is only a bar long but because you can clone and edit any drum track it's less of a problem than you'd think. You can change each drum's velocity so adding expression is simple too. After making a few drum loops I added my chords. 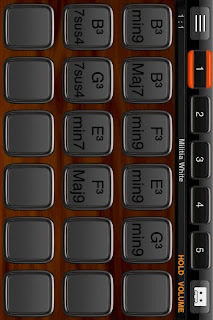 With my iPhone beside me I added the chords from PianoStudio note by note to the Melody Crafter. Here you can create loops up to eight bars long which is about as much as you'll need. Note lengths and velocities can be changed so sustained chords aren't a problem. I used a sample from the sample library which is the same process as adding drum sounds. Interestingly you have an ADSR envelope on samples which works very well. Once the chords were in I created a bassline. I used the onboard synth for this. There are a few presets but I opted for 'default' and made my own sound. If you're used to 3xosc synths then this is a breeze. If you're not then choose a preset and mess around. It's a great little synth, the only downside is it's mono but with any 3xosc synth you can build a chord like note through detuning and this goes up or down two octaves plus it has a fine detune for fattening up the whole sound. ...opted to use the Song Crafter. Here you can add loops and watch the track being built. Any loop can be edited from here and because you can have four different loops per track you can mix and match to add variation. It's much the same process as any bit of music software I've used so was easy to finish the track. Each individual track can have two effects and you add them here as well as the master track reverb. You can also have keyframed effects on any effect and I used keyframing to create a fade on the master track. I've only really scratched the surface here. I haven't mentioned sound sampling. I have a 1st gen PSP with a GoCam camera and Beaterator lets me use the camera's mic to sample in sounds. 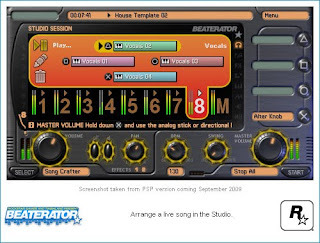 There's also a very respectable sound editor so adding and using your own sounds in a Beaterator track gives you limitless possibilities. To find out more visit the Beaterator site. As a final note. If you don't have a PSP then don't fret. 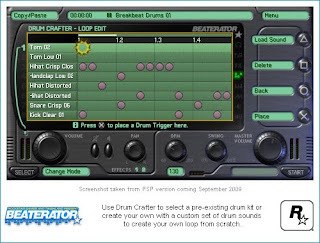 Beaterator should be out on the iPhone by the end of the year. If it's the same as the PSP version you're in for a whole lot of fun. Here's a rundown of how I made the 'Militia White' track below. All my tracks these days tend to start in an iPhone app called iShred. 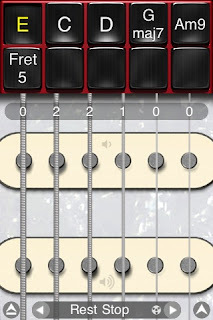 It's a guitar app and it makes putting chords together really easy. It's a lot of fun and is so easy to play with that all my efforts are put into getting a track started rather than messing about with settings. Once the chords are in place I transfer them over to PianoStudio. It's another iPhone app and because it shows you the notes in each chord being played it makes moving them to my new mobile studio a breeze. 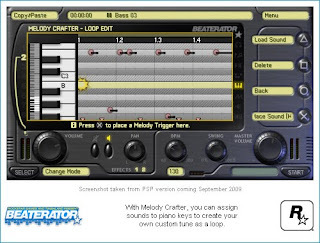 My new mobile studio is called Beaterator and it runs on my Sony PSP. 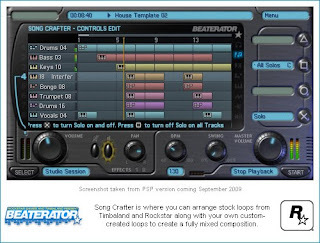 The software is tied in with Timberland which is great for attracting attention but won't attract many musicians who may well think its a game and not a music production tool. That assumption would be very wrong. What you get on that little UMD is well worth the £23 price tag as you'll find out in the next post. This is the new AmpUT track. It's called 'Militia White' and will appear on the 'Militia Immaculate' album. The folks at the Apple store replaced my iPhone. Then it all went wrong. Numerous reboots and retries over the next 24 hours saw me lose faith in Apple making anything work properly on Windows. Anyway, it's done now. 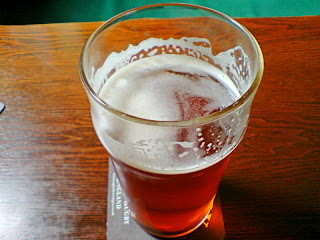 Since then I've had success with my music on Ukulele and PSP and I'm blogging from a pub. Here's a picture of my sanity machine. As far as tech goes the last 48 hours have been pure hell. My iPhone died, the replacement wouldn't talk to iTunes on my Vista machine and the whole update process has taken over 24 hours. That in itself is a small miracle because I managed to get the update in by sheer chance. I still don't trust my iPhone. 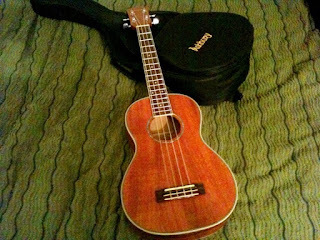 On the other hand my Ukulele now stays in tune as the strings have bedded in and I learned 'Eleanor Rigby' by some band called the Beatles, you may have heard of them. All that remains is to transfer the novel to my WP and that's all the techie stuff done. 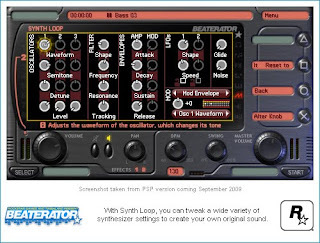 I can then get back to Beaterator and actually lay my loop blocks into a song. Once that's done I'll get it online and you'll get to hear it here first. It won't be long now, maybe a day or so. Because while trying to update my iPhone the newly installed iTunes managed to kill my iPhone. So now I have no camera or music apps or phone or bugger all really. I have to take a trip down to the Apple store tomorrow and get them to help me fix it. That's going to be a pain in the rear because there will be lots of people who probably all have the same idea as me. That's what I want to talk about. On one hand it's a very useful tool, both in my day to day life and my creative endeavours. On the other hand it's a crazy addiction that acts as a plug hole for pouring time into. If I so wish I can write a whole tune or a book on this device or I can stare aimlessly at peoples comments on their and other peoples lives hoping that something they might say moves me enough to comment myself. At any point in the day I can take pictures for myself or for other people to see. I can educate myself by listening to audiocasts about subjects I know nothing about. I can know what is happening anywhere in the world and in most cases know how it looks and sounds. In fact I with millions of other people are now the most informed group ever to have existed. Strangely, as time goes on, I really think that I should select more carefully what I wish to know and from whom I source that information. Media overload is no good for me or anyone else. Next I get tearful, upset. It's the light that upsets me. Photophobia is cruel. Only pitch black will save you. This mixes with a deep depression and unexpected highs. I can find humour in most things. Often cruel humour and I instantly feel guilty. The whole rollercoaster ride can last for hours but it does ware off. You just have to be careful what you say to people. When it does all ware off there is a sad but satisfying calm. I go through all this about once a month but in the last two weeks I've experienced it eight times and the ringing in the ears and sickness are returning. 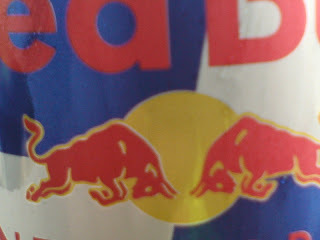 I haven't had that for a long long time. I hope you never have to go through this. It is truly bizarre. Thing is I'm used to it and I feel bad for the familiarity I have with migraine. It's like having a bad friend and that's not right. I thought I'd tell you about what I live with. I see a dot. It's bright and I know a migraine is about to start. My only defence is two pain killers to avoid the inevitable headache. They won't stop it but they might shorten it by a day or two. Next the dots start to grow. They look like TV static but they're very short lines and not dots. This goes on for twenty minutes to half an hour obscuring my vision. I once became totally blind. When the dots go the headache tries it's best to disable me. If I've missed the tablets I'm a mess. Everything is a problem. The pain is physical but also mental. Things like sounds make a virtual lump inside my head hurt. I felt the lump today. Imagine four or five cubes randomly stuck together with their cornets sticking into your brain and skull. That's the lump. If I've taken the tablets the lump is almost non existant but I get a dull ache instead. After thirty years I can live with that. I don't like it but it's better than the lump. I've been working on my OTP project tonight. Far from getting bogged down in its complexities I'm enjoying the challenge and it's relatively easy to work on. I can put this down to the slow and methodical pace at which I'm working. I'm researching every single step. I have a dream that this new method will make it as far as a software application and tonight I thought of an ideal partner in crime. Hopefully he'll say yes. Tonight was the first time I really got my head into my RM1x. It's an amazing bit of kit. I love the sounds and on the surface it's quite easy to program. Underneath it's a beast with quite awesome power. Step by step I'll get into every corner and be able to produce some impressive stuff but that will take time. It will eventually send MIDI program change messages to my PodXT and I'll think about performing live again. It will be strange to approach MIDI from an audio only angle as I'm more used to having to control video. MIDI is easy. Once you've re-aquainted yourself with a library of manuals. Here's to some bed-time reading. It's taken longer to get the figures than it took to crack the Enigma codes but Bletchley Park has finally secured some lottery funding. I don't want to add any negativity to this wonderful news but in all honesty I'm thinking why did this take so long? The issue of funding has been going on for years. It has taken the extremely hard work of volunteers and campaigners to get things to this stage and this is just the beginning. There seems to be a ground swell for Bletchley Park at the moment. Let's hope it continues. I have to admit that I'm softening to video. Using my iPhone and services like Qik and TwitVid is making life pretty darn easy for the occasional amateur film maker. These days I'm leaning more toward Qik. Not only because it is very quick but it has fantastic integration with YouTube which is my preferred online storage for footage. Twitvid is just as useful and again easily connects with YouTube but the quality doesn't seem to be as good as Qik. Long gone are my VJ days when working out aspect ratios and codecs made my brain bleed. Sorting that stuff out really put me off video as a medium even though it was my living. These days devices like the iPhone are making Point, Shoot and post not only hastle free but enjoyable too. I just might start using video more. These are the chairs I sometimes sit on at work. Rather than just show you them I thought I'd present them in glorious 3D. This is one of my better 3D pictures. This picture takes a while to get used to. Look straight ahead, your left eye looking at the left picture and your right eye looking at the right picture. When you're doing it correctly you'll see a third picture in the middle which appears to be in 3D. If you can get it to work it looks pretty amazing. Keep trying. It's worth it. This is my lunchtime view today. It doesn't look like much but this trading estate has got excellent 3g so I can surf the web and keep up with what's going on in the world. This is a good thing because there's nothing going on here. Apart that is from people going to the batch wagon for their lunch. I'd like to open a lunch wagon offering advice like "Don't come here on your lunch hour, it's a waste of time." I wonder how many customers I'd get. If you drive a truck you can get your head down here. It's well known among truck drivers and transport authorities that the heavy goods vehicle is well and truly dead. They all know that a HGV is now an LGV. This means that this sign informs no-one and is therefore useless. That means that if you drive an LGV you can get your sleeping bag out and get the kettle on for tea and Pot Noodle's. Sometimes I wish I owned my own truck. By this blogs title I mean that I should be spending more time here. As much as I like Twitter it's taken me away from my blog and that's not good. Twitter belongs to everyone but this is my space and neglect of it is a bad thing. I don't want to move away from this blog so I'm coming back to what I know. I'm also going to start carrying my camera and blog things when I get home. I think the saying "Use it or lose it. " applies here. Add a convenience store. Open your doors to the public and see what happens. I'm guessing that one part of the business will disappear or the whole place will close down. Mr Lion says we need booze. I'm inclined to agree with him and it is nearly that time on a Friday. I must pop out and source a Merlot or something of that nature. I'll be back soon. I might also try and find out why my wi-fi signal is so flaky these days if I can be bothered. This week was a good week until today. My manager managed to spoil that with one of his little talks. Now unless I gain some kind of supernatural power that allows me to know the thoughts of others or predict the outcome of their actions then I really can't help. After all I wouldn't want to be nannying anyone. It's just not in my nature. The Bank Holiday weekend is looking grey and it may well rain. But who cares? I've got a some writing to do, some Reading and I've got a really good new chess app that has really excited me about playing again. Then there's tonight's wine and beer and web traul so it's looking good. As for the rest of the weekend? Who knows. I'm leaving it to chance. August 15, 2009: The Cambridge Five: "In the 1930s, five young Cambridge University students were recruited by Soviet intelligence to penetrate the British intelligence community. In the course of their decade-long espionage career, the Five did enormous damage to Western security. British intelligence author Nigel West examines their motivations and activities, and reveals new evidence he has unearthed in Soviet intelligence archives. " The trouble is that Paul likes Neville and he jumps into Sausage's basket when Neville is in there thus making Neville's available room much smaller. This tends to upset Neville and upon me observing the squash he jumps out. This means that Neville doesn't get much rest as I am constantly running around the house doing stuff. One day I will forget to look and take Neville and possibly Paul to work which would upset them both and cause me a few problems. Cat food is the answer and I must remember that. Shake the nuts before leaving for work and my feline friends will appear especially if it's Yams Nuts which they like the most. I'm sure the Ocean Fish variety has some kind of cat nip additive in it because the boys ignore jelly food and head straight for the Yams Nuts. I'll never know, I'm not a cat, although I can scratch fleas out of my ear with my foot. very happy with it. It needs a clean and a new ribbon but that's all. collectors fair and hopefully some breakfast. though as there are some really decent bargains to be had. One of the better car boot Sunday's. My friend Dave says I should take this into the shop. ...it certainly isn't a joy. I'm in the quiet village of Sileby. Apart from it's not quiet. There's a man cutting the grass with a petrol trimmer thing and he's very loud. I used to spend time here many moons ago but not any more. All I can say is that the fish and chip shop used to be very good but I'm not sure about these days. If I didn't have a big bundle of copper on the truck I'd go and find out. This is what no network looks like. parked next to. 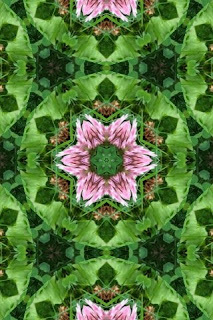 This one is of a clover flower and grass and stuff. all a very productive time. Let's see how the layout is. It's very important to me. my posts through Flickr it all works just fine. 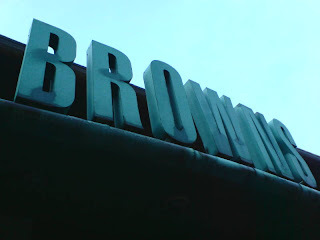 I have been neglecting this blog for a while now. Occasional posts have been showing up here and there but it's nothing like it used to be and for that I'm sorry. The truth is that I've been messing about with my iPhone and coming up with new ways of generating content. It is very distracting. I'll try and get back to my old ways but until Blogger come up with their own iPhone app things may be a little slow. I do like Shozu but I really don't want to be advertising for them every time I post. The pictures also come out a bit too big and spoil the layout here. I'll keep searching for and app I'm happy with but in the meantime it's back to sitting at my desk and blogging from there. As soon as I have a solution I'll let you know and we'll be back in business. 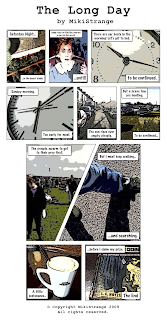 The Long Day is my first graphic tale. It has a couple of 'to be continued's in there because I hadn't planned to put the three strips together but I'll remember to take them out next time. The short story was produced on my iPhone 3GS with some cool software and bolted together on my PC using Photoshop. I must say that I really enjoyed this first little outing and I plan to do more in the future. I've got a short story that might benefit from the comic strip treatment so I'd better get that out of it's first draft. More graphic tales to come. I've got a couple of good books, a xylaphone thing, a signaling mirror, a shoebox tape recorder and a fantastic typewriter. Everything works too. I've yet to date the typewriter but it's reasonably old and in decent condition. Time to relax now with My Cat and some wine. Sundays just keep getting better. I'm being honest about being slack. My first proper iPhone blog. I thought I might be able to give you a nicer view but it's a miserable day. Never mind, at least my iPhone is set up now. After an equally miserable week at work I think I might just see what Bargain Booze has to offer. Me thinks that's a good idea. I've just got an email from Foes Reunited. They've got a new groups feature and asked me if I'd like to join one or more of said groups. There were lots of inane groups such as Top Table (WTF?) and Star Trek. But top of their list was Over Forties. What about a group about Fire Starting or Decapitation or C#*k or anything other than your lame choices. Next thing I know you'll be inviting me on a cruise around the med. I'm only signed up to stop other people claiming to be me. ... and rightly f#%*ing so. It's nice to be here and relaxing. Work has been rubbish all week and O2 data has been out for a couple of days so no blogging. Once I'm all switched over I'll be blogging from a new iPhone. Might have finished migration by Saturday. It'll be a mixed emotion day. I love my setup now but I must move on. It's wet outside and wet inside. I left my house in a heavy downpour wearing my outback coat. Then the rain stopped and the sun came out making me very hot in said coat. Having walked into town I've arrived at the pub so now I'm wet inside. I can't wait until winter. Sunday breakfast at Steve's in Market Harborough. 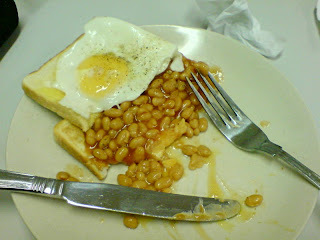 Eggs on beans on toast and coffee. It's the perfect antidote to wading through antique stalls. I didn't find anything today which is good because I have too much stuff already. I might get a cake though.